The women fitness industry is on the verge of day by dayincrease because of the addition of CrossFit in their competitions and workout. Also, women are fond of the benefits to perform CrossFit and are relying on it more, because it helps them get into shape, get lean and live a healthier life. Due to this, Rogue Fitness has produced the Bella Bar 2.0 in their collection of amazing products to make the women of world perfect in CrossFit events. 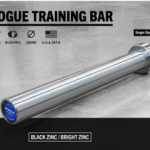 The Bella Bar 2.0 by Rogue fitness, is an affordable bar especially for women and beginners, which will make a nice contribution in a commercial or a garage gym. The bar is great for beginnerswho want to focus on their form much more and overall perfect for women who desire less weight and adjustable grip. The bar gives a great and comfortable feel on handwhich is very important for most of the women. The pre-marked etching for grip makes it very easy for beginners to quickly make themselves set up for heavy lifts. After testing the bar in different workouts, it is found that the barbell can be used for power lifting, CrossFit style workouts and Olympic weightlifting. The bar can be dropped more aggressively from a certain height if bumper plates are used. 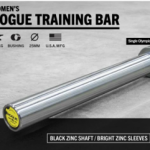 The Bella Bar is one of Rogue’s invention, which is a multipurpose 15KG barbell designed for female athletes. 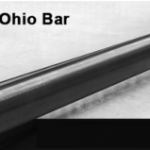 Fully engineered and manufactured in Columbus, Ohio, this adaptable ladies bar is genuinely optimized for powerlifting, Olympic weightlifting, or a CrossFit WOD. The Bella Bar is one of Rogue’s beauty to consider. 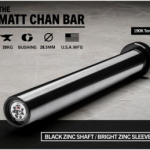 The bar comes with a black zinc shaft having bright zinc sleeves. The shaft gives a perfect example of its extravagant beauty and with a heavy duty performance it’s also durable, hence expecting nothing less from a renowned company like Rogue Fitness. The look of zinc shaft and sleeves is simply eye warming, and has the ability to hold up the expectations of a standard CrossFit bar. This means maxing out the plates and throwing them on the gym, won’t have a wear and tear on the bar like there would on a lesser quality one. 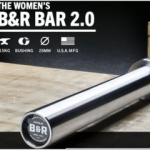 The bar consists of dual knurl marks, which isbest for women who have different ways of doing their lifts, as it provides them with some options for hand placement. A major part of performing your CrossFit workout is to make sure that you are feeling comfortable, it doesn’t really matter where your hand placement is. And with the dual knurl marks, you can choose at which part you are feeling more safe and comfortable while performing heavy lifts. Also for women who have comparatively shorter and petite hands, the grip will fit perfectly for them. Its providing a major role in women’s CrossFit competitions or combining events at the CrossFit Games. The weight of the Bella Bar comes is 15kg and the diameter is 25mm with no center knurl, and provides the same Rogue’s standard Dual Knurl Marks and 190 PSI tensile strength just like the 20kg Ohio Bar. The mixed knurling pattern itself gives a tight but comfortable grip on both Olympic and Power lifts, whereas, the high quality US steel and snap-ring bronze bushings produce great balance of stiffness and natural switch. The Bella bar is constructed with many attention and details than any other bar in the Rogue’s family, specifically designed for women’s weightlifting on equal grounds. 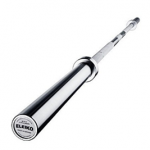 While there are many women out there, who do a competition with guys and try to liftheavy as much as their sexual-counterparts, the lighter Bella Bar is best for the thosewho want to make the sport easy and enjoy lifting by puttingless stress on their body. With the name and label of the bar “Bella”, doesn’t really mean that men can’t use them. Having marketed mostly towards women, men can also benefit from them who just have started weight lifting and want to focus on their form and movement more, than lifting heavy on a first go. The Bella bar might not be the perfect bar, on which CrossFit competitors usually rely and work, as it will change the way they do preparation, but it is really considered for the ones who to perform a mixed up workout. The bar is a women type bar. The use of the bar is for Weightlifting, Olympic Weightlifting, multipurpose. Bar consistsofa weight of 15kg. 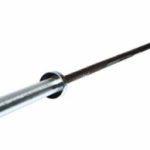 The bar consists of Olympic knurling and has no center knurl. There are two knurl marks presented on the bar. 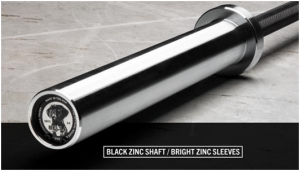 The shaft coating on the bar is of Black Zinc. The coating on the sleeves is of Bright Zinc. Comes with a construction warranty, with certain terms and condition to follow. When I first purchased the Bella Bar 2.0 for my wife, she was having trouble performing powerlifts and Olympic lift, on my Rogue bar 2.0 in our house gym. The basic concern she was having, was the grip that wasn’t really fitting on her hands. After purchasing them, it made our daily workout much easier, because now we don’t really have to take turns and use the same bar. The Bella Bar has a great spin of the sleeves. There is a Bella bar in my gym which doesn’t really had that impressive spin, but the one which I received was having, though an impressive gesture. Most importantly, my wife loves these bars because it fits comfortably in her baby hands with dual marks on the bar to give an adjustable grip. Even though, I started using Bella bars too but I prefer for me a 28mm training bar along with Rogue’s Fronting bushing bar. The spins of the bar are very nice, with an excellent whip, even when you are going with lighter weights. The knurling is nice and sweet-sounding, hence making it perfect for high rep exercises. The Bella bar consists of a solid finish, without getting plunder, which most of the users said about it in their reviews on Amazon, though I didn’t have such thing. With lighter weight and smaller handles, you can’t beat the fact that Bella Bar 2.0 offers extensive features and is a great addition to any commercial or home gym. Men can also benefit from it, especially those who have just began CrossFit and really want to improve their form and posture. Making me very hard to complain, especially when the bar consists of a great price tag too. 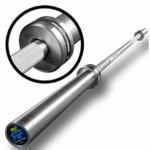 Overall, this is a top quality barbell that would be a superb addition to any garage or home gym. Provides a construction warranty of one year. Bar can be used for Weightlifting and Olympic Weightlifting. Rogue provides a great customer service. Gives a smooth spin and perfect knurling. Expensive than most of the bars. The bar enlightened towards women aspect more because of its name “Bella”.